Barbara Ann (Runyon) Bowers, 60, of Decatur, Tennessee, died Tuesday, December 7, 2004, at Life Care Center in Athens, Tennessee. She was a member of Shiloh Baptist Church, a member of the Meigs County Lions Club, and part owner of Bowers Funeral Home in Decatur, Tennessee. As a licensed lab and x-ray technician, she had been part owner of the Delbarton Clinic in Delbarton, Mingo County, West Virginia. As a licensed funeral director and insurance agent, she was part owner of Bowers Funeral home in Pikeville, Tennesee, also She was preceded in death by her father, Rev. Buddy Runyon of Delbarton, WV, and son Scott David Bowers of Mingo County, West Virginia. She is survived by her husband James A. (Jim) Bowers, Sr., of Decatur, Tennessee; her son James Allen Bowers, Jr. of Decatur, Tennessee; her mother and step-father, Ollie and Hesse Hardin of Decatur; three brothers and sisters-in-law, Gary and Brenda Runyon of Decatur, James and Patricia Runyon of Ragland, WV, and Avril and Emma Runyon of Decatur; two granddaughters, Cassie Taylor Bowers of Dayton, and Brittany Paris Bowers of Dunlap; One grandson, Braden Bowers of Dunlap; several nieces and nephews. Funeral services were held Friday, Dec. 10, 2004, in the Bowers Funeral Home Chapel with the Reverends Eric Gerin, Max Redman, Taylor Colbaugh and Jimmy Maynard officiating. Burial will be at Decatur City Cemetery. Bowers Funeral Home of Decatur was in charge of arrangements. Barbara Ann Runyon Bowers, 60, of Decatur, and formerly of Delbarton, W.Va., went to be with the Lord following a long bout with cancer on Tuesday, Dec. 7, 2004, at Life Care Center of Athens. She was a member of the Shiloh Baptist Church and was a member of the Meigs County Lions Club. She was half-owner and operator of the Delbarton Clinic along with a John Hopkins graduate, Dr. E.B. Headley, for a good number of years. She was a licensed lab and X-ray technician and was half-owner of Bowers Funeral Home, located in Pikeville, until sold, and was presently half-owner of Bowers Funeral Home in Decatur, where she was a licensed funeral director and insurance agent. She had a heart of gold and was a good wife, mother, grandmother and sister. She was preceded in death by her father, the Rev. Buddy Runyon; and one son, Scott David Bowers. Survivors include her husband, James A. Jim Bowers Sr. of Decatur; one son, James Allen Bowers Jr. of Wartburg; her mother and stepfather, Ollie and Hesse Hardin of Decatur; three brothers and sisters-in-law, Gary and Brenda Runyon of Decatur, James and Patricia Runyon of Ragland, W.Va., and Arvil and Emma Runyon of Decatur; two granddaughters, Casie Taylor Bowers of Dayton, and Brittany Paris Bowers of Dunlap; one grandson, Braden Bowers of Dunlap; and several nieces and nephews and a host of brothers and sisters in churches all over the country. Funeral services will be 2 p.m. Friday in the chapel of Bowers Funeral Home with the Rev. Eric Gerin, the Rev. Max Redman, the Rev. Taylor Colbaugh and the Rev. Jimmy Maynard officiating. Burial will follow in Decatur City Cemetery. Pallbearers will be Herman Thompson, Wayne Brown, Chuck Lillard, Danny Smith, Mike Long and Willard Plank. The family will receive friends from 5 to 9 p.m. Thursday at the funeral home. Bowers Funeral Home of Decatur is in charge of arrangements. Barbara Ann (Runyon) Bowers, 60, of Decatur, died Tuesday, Dec. 7, at Life Care Center in Athens. She was a member of Shiloh Baptist Church, a member of the Meigs County Lions Club, and part owner of Bowers Funeral Home in Decatur. As a licensed lab and x-ray technician, she had been part owner of the Delbarton Clinic. As a licensed funeral director and insurance agent, she was part owner of Bowers Funeral home in Pikeville, also She was preceded in death by her father, Rev. Buddy Runyon; and son Scott David Bowers. She is survived by her husband James A. 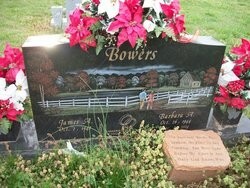 (Jim) Bowers, Sr., of Decatur; her son James Allen Bowers, Jr. of Wartburg, TN. ; her mother and step-father, Ollie and Hesse Hardin of Decatur; three brothers and sisters-in-law, Gary and Brenda Runyon of Decatur, James and Patricia Runyon of Ragland, WV, and Avril and Emma Runyon of Decatur; two granddaughters, Cassie Taylor Bowers of Dayton, and Brittany Paris Bowers of Dunlap; One grandson, Braden Bowers of Dunlap; several nieces and nephews. Funeral services were held Friday, Dec. 10, in the Bowers Funeral Home Chapel with the Reverends Eric Gerin, Max Redman, Taylor Colbaugh and Jimmy Maynard officiating. Burial will be at Decatur City Cemetery. Bowers Funeral Home of Decatur was in charge of arrangements. This div has more content than it can hold. Therefore, scrollbars appear to allow the user to scroll. To create a frames based website, simply create a div for each frame, and specify 'scroll', 'auto', or 'hidden' to determine whether the user can scroll or not.